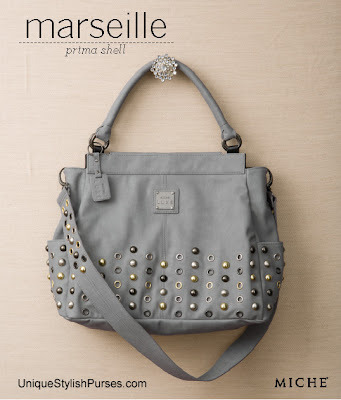 The fashion-forward styling of the Marseille for Prima Bags will make your heart beat a little faster and bring that extra touch of bling you love to any outfit. Soft faux leather in a cool shade of light grey is accented by oversized stud and grommet detailing in various metallic colors—it’s a trendy look that is both flirtatious and fun and perfect for when you want to really shine! Side pockets.